I purchased this little gem a few years back, and recently lent it to a friend of mine who visited the Peninsula, and according to him it was of great assistance and very informative (although being a retired soldier I did not lrust him with the map, him being a retired officer). Map drawn with admirable clarity and full of detail. The text is admirably clear, with an enormous amount of detail. For the pilgrim and armchair traveller alike Major & Mrs Holts Battlefield Guide to Gallipoli promises a wealth of information. Included with the linen-look book is a superb foldout, fully indexed double-sided map. The book shows meticulous research and eye for the human touch. Published by Pen & Sword Books in limpback. 272 pages. 190 col illustrations. The fourth in the Holts' important series of Battlefield guides (following the Somme, the Ypres Salient and the Normandy Landing Beaches) this is so much more than a guidebook (of which it is the most up-to-date, comprehensive, ever produced). 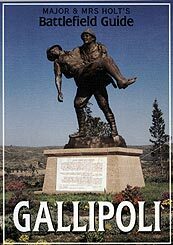 It is the book of the Gallipoli Peninsula. It charts in fascinating detail what happened at every recommended stop and brings alive, with cameos and anecdotes, the people who fought there: leaders, heroes, historic regiments, poets, 'Tommy', 'Digger' and 'Johnnie Turk'. Sinking of the Bouvet. The French ship, which went down with the loss of all hands on 18 March 1915, was probably hit by one of the ingenious floating mines from Canakkale. The rails along which they were propelled can be seen at the Naval Museum in Canakkale. The Man with the Shell. Cpl Seyit carried the last 275 kilogram shell to his battery when 61 of his comrades were killed by Allied Naval shells on 18 March 1918. The shell hit the battleship Ocean which later sank. Seyit's statue was erected in 1929. Gully Beach remains completely unspoilt, much as it was during the Landings in April 1915. The well was dug by Joseph Murray of the Hood Battalion, RND on 21 July to supply water to the Division. It stands near the entrance to the infamous Gully Ravine. View from Walker's Ridge to Ari Burnu & North Beach. To the left is the distinctive outline of the Sphinx and the dramatic and rugged gullies lead down to Ari Burnu and North Beach. The landings of 25 April were made just out of sight on the left in the tiny bay which has been renamed Anzac Cove. Beach CWGC Cemetery and Headstone of Pte J. Simpson. Simpson's full name was John Simpson Kirkpatrick. He was born in South Shields and emigrated to Australia in 1909 enlisting on 25 August 1914. After the landings he plied up and down the dangerous Shrapnel Gully with a donkey he called Murphy, bringing down the wounded for medical treatment until he himself was killed on 19 May. A pine tree grown from a seed of the original pine stands in this cemetery where over 1,150 Australians are buried. The message on Driver Bergin's headstone reads, 'A mother's thoughts often wander to this sad and lonely grave'. There are 190 coloured illustrations like these in the book.